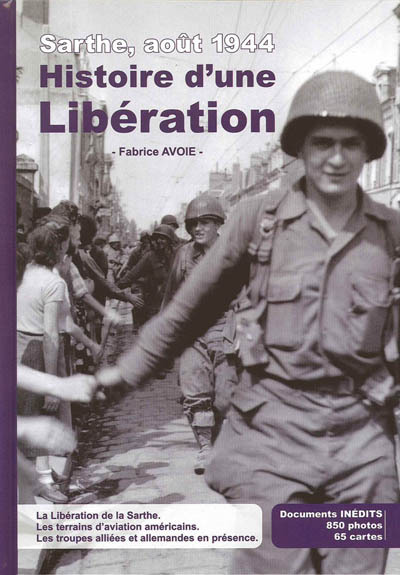 Recently while doing some research for battles around my house in August 1944 and the American breakout from Normandy through Brittany and Pays de Loire I kept coming across references to this book, so for Christmas I ordered it from the author, to my surprise Fabrice works in Mayenne and we scheduled a rendezvous at my home. Fabrice spent 15 years doing the research on the push from Mayenne department through Sarthe to capture Le Mans and then pushes South and finally the advance North to close the Falaise pocket. Fabrice attended several reunions in Germany, France and America receiving photos and anecdotes from the war from the remaining veterans. Published in French in 2009 it is loaded with information and Photos I have never seen before. A good mix of German units are covered including day to day breakdowns and unit strengths; 9th Panzer, Panzer Lehr, 352nd Infantry Div, 708th Division, 91st infantry Division, 77th Infantry Division, Sicherungs regiment 1, Sicherungs regt 194, -195 and 196, 17th SS, 5th Fallschirmjager, Flak units and various retreating units and scratch batns. Allied units include; US 5th Armoured, La 2nd division Blindee Francaise, US 79th Infantry Division, US 90th Infantry Division, US 80th Infantry Division, 106th US cavalry group. Very interesting research regarding the aviation units in the allied support role. The Hard back 440 page book is well worth the 38 euros that I paid for it, although the text is in French it is a must for those interested in the southern flank of the Falaise pocket, lots of photos, small unit actions and after battle reports to wade through now! I ordered direct form the author to save 30 euros from a shop.